NintenGen: Some pictures to share with you....what comes to your mind? Some pictures to share with you....what comes to your mind? It's true that Sony copied Nintendo to great success with the dual sticks in the PS1-2, buy will they really succeed this time? 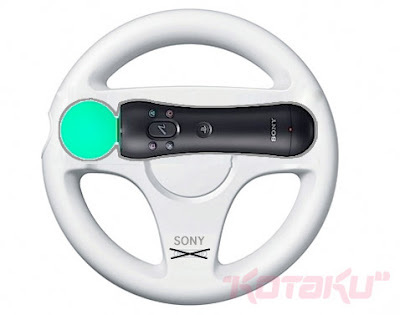 Who is going to spend $ 400 on a new PS3 and the Move controller combo just so they can basically have Wii in HD? For me personally I don't see the Playstation Move having any impact on the Wii sales and if rumors are to be believed, then we'll be seeing the Wii2 in 2012 anyway. So I see Wii owners staying put for another year and half and then when Nintendo comes out with their next system making that jump and not for this imitation. Yes yes, the moves works a little different than the Wii remote but it's still essentially a copy any way you look at it. I saw the new move controller on the news they also said to expect alot of 3D gaming and that the PS3is the only console on the market capable of doing 3D games. From my perspective, the PlayStation Empire collapsed years ago. However, many people have not realized this. Many believe that “technology” of the PS3 determines its lifespan (it doesn’t, only consumer interest determines a lifespan). When the PS3 slim came out, PS3 momentum rocketed up. The Wii was in decline. However, things have changed. PS3 momentum has really come down since the release of the Slim. Sony fans are in absolute denial of this. Wii momentum has rocketed back up again resulting in sell outs everywhere. Sony fans are also in absolute denial of this. They believe more PS3s would sell if Sony wasn’t ’supply restrained’. Sony might have had some operation problems, but the PS3 slim was never sold out online. I know because I have been constantly checking it. The disruption literature forecasts the so-called “motion control battle” to end very suddenly, very spectacularly, and it will herald the end of a great firm. In this case, it will be the PlayStation Empire. What is more interesting is Natal as Microsoft, who understands the ways of disruption, is deliberately placing Natal as having the same values as Wii (expanding the market, making gaming more accessible, etc. etc.). Microsoft is also now paranoid about Natal which will be to their advantage. The big issue is the execution of Natal’s strategy. The Natal strategy isn’t bad, it is the execution. Is controller free gaming going to work? I don’t think so. Even Nintendo struggles with making motion based games with the Wii-remote. But there will be no prolonged 16-bit war. This will be over so fast. And it will shock many people. I don't know why this will put the breaks on Wii's success. The Wii already succeeded from a marketing perspective, anyway. Nintendo said it right from the beginning that the Wii (which was called Revolution at the time) will change the way we play games. Microsoft and Sony played right into their hands. Even if Move and Project Natal does become more successful for its competitors, Nintendo will already move onto their next console. Nintendo has tasted failure during the GameCube-era. They have enough profits to keep them afloat. 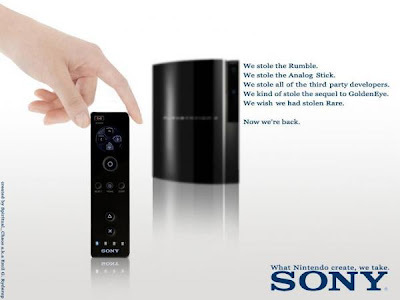 That one image, mentioning things Sony has stolen, chose some pretty bad examples. "they wish they stole Rare?" Really? That's the best they could come up with? Either way, Sony has stayed in business this long stealing ideas and they will continue to stay in business. Nintendo "struggled" with GameCube and they came back to be #1. Watch out for Sony next gen. It could happen all over again. The only thing this device has going for it is the perception it's the same thing as Wii, it's true but it's far less efficient then Wii and when that is realised and broadcast on the internet, in publications and on TV it will bomb. SOny's pockets are deep but not deep enough to bury a truth.